I just uploaded my library for representing constructible numbers in Python to PYPI, so you can install it with “pip install constructible”. It was very straight forward following Peter Downs’ guide “How to submit a package to PyPI”. The sample Program from the previous post not only demonstrated some OpenGL calls and concepts, but also illustrates that code organization quickly becomes important as soon as the program grows beyond a couple of lines. So I refactored some of the OpenGL Interface code into classes. I noted that for each draw call I need to setup the OpenGL context by binding some Objects like the shader program, the target framebuffer or the source texture. I also learned that after you are done using any OpenGL object it is helpful to unbind it. The reason for this is not that they would use too much resources, but rather decoupling. It might be that your program just coincidentally has the right objects bound but as soon as you move any of the code, something will break. Explicitly unbinding helps avoid these dependencies of different parts of your program on what GL objects other parts might have bound last. This style has the advantage of being able to specify the objects used for a draw call in a single with: line. On the other hand it also removes flexibility on the bind and unbind times of the objects. I think in most cases this is not a disadvantage because most times many objects depend on each other logically (e.g. use this texture with that shader together). A refactored version of the last posts example which uses the context managers is available on github. 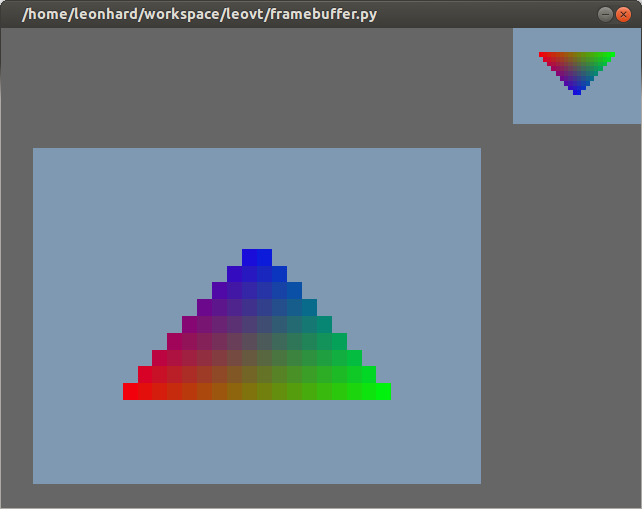 This post will show you how to set up a framebuffer in OpenGL using Python and Pyglet. See my previous post for some tips how to use OpenGL functions from Python. As this is a demo program I did not structure it with python classes. However the complexity is already big enough to see that this flat structure is not suitable for any larger program. The full program is available on github. In this example the framebuffer is used to render the triangle from the previous post in a very low resolution (30×20 px). This Image is then used for texturing two rectangles in the main window. Note that both in the framebuffer and on the main screen I do not use any vertex transformation. Therefore only the x and y coordinates are used. The lower left corner of the screen has coordinates (-1, -1) and the upper right corner (1, 1). Texture coordinates however run from 0 to 1. In the previous program there was only one GLSL program and only one vertex buffer. Therefore it was convenient to store the vertex attribute bindings in the default OpenGL state. In this program however we switch back and forth between the triangle rendering program which uses color attributes for the vertices and the copy to screen program which uses texture coordinates. A vertex array object stores the information how data in a buffer is linked to vertex attributes of the shader program. So I can define this connection once (using glVertexAttribPointer) and then I only need to select the correct vertex array object when drawing. OpenGL needs to know the size of the rendering target. In this program there are two targets, so you need to tell OpenGL the new size every time you switch the drawing target. The program has 300 lines, and as I mentioned before, it could benefit well from more structure and also from deduplication of code. Setting up two GLSL shader programs, two vertex array objects, two vertex buffers and two drawing steps has lead to some duplication, which could be avoided if these were all each two instances of a shader class, a vertex array class and a vertex buffer class. Try out the complete program. You can get it on github. Please comment below if something does not work or what I could explain better. Calling some OpenGL functions from Python with pyglet can be a bit tricky due to fact that the functions are only thin wrappers around the C-API. My sample program demonstrates some calls for using modern OpenGL with pyglet. The program is intentionally quite flat, without any classes. In a larger program I would manage the involved OpenGL objects with Python classes. This is not a full tutorial, but some aspects of the sample program are explained below. I used Pyglet because it includes an OpenGL binding and supports Python 3. Many OpenGL calls use a call by reference / pointer for returning values. These can be called using ctypes.byref. The example first creates a GLuint initialized to zero and then passes a pointer to glGenBuffers. Using a struct for passing vertex attributes can take advantage of the meta-information provided by ctypes. It is also easier to manage than a flat array of float values. In the example the vertex shader takes a vec2 and a vec4 as attributes. Note that as in the example above I use the type aliases provided by pyglet.gl in order to ensure compatible types with OpenGL. In ctypes you create an array by multiplying the type object. And the structure is initialized very easily; here I create an array of three vertices, each containing a 2D position and a 4D color. OpenGL expects C-style strings, so it is easiest to use byte strings. ctypes has string buffers which can tranlate between bytes in Python and char* in C.
They can also be used for retrieving strings from OpenGL such as the log of a shader compilation. Finding out about getting the compilation log really helped me when writing my own shaders. The code for passing the shader source to OpenGL is still somewhat messy with a ctypes cast. I would be glad if you can suggest a better alternative in the comments. Try it out or look at the sources in github. tictactoe.html is a HTML 5 file with an embedded SVG graphics representing the playfield. The code in tictactoe.js is using jQuery to hide and show the O’s and X’s in the playfield as the game proceeds. jQuery is a java script library which makes it easy to manipulate the DOM, i.e. the structure of the document while it is being displayed in the browser. It also abstracts away differences between different browsers. Google hosts several versions of jQuery so you dont even need to have it on your server, only a reference to the google hosted copy is needed. This has the further advantage that the library is possibly already cached when the user has used a different site with jQuery before. In this post I will show how coverage.py can help you write complete tests and how to write a test for a case that should not ever occur. Meanwhile I am adding more bytecodes to my interpreter, so if you are interested in my implementation of python bytecodes take a look at https://github.com/leovt/interp/blob/master/interp.py. In my last post i described why and how I switched to unittest testing. Running the tests after every code change makes it much more comfortable and I can be reasonably confident that the cange did not break what was working before. This script will record which lines of code are executed and then produce a nice report. Then run coverage again to produce a report. Apparently my tests miss one line, line 269 in interp.py. This line is throwing the exception, when an unknown bytecode is found. How can I write a test that executes this line? I could simply run my interpreter with bytecodes that I have not yet implemented, but this would invalidate the test when I add those bytecodes later. Therefore I want to test with a bytecode that does not exist in Python, e.g. bytecode 255. By the way the coverage tool can also produce a very nice html report hilighting with colors the covered and not covered lines in a python file. So far I have added a little test function or two in the top of the interp module and changed it for every new feature I wanted to implement in the interpreter. Tests are in same file as “production” code. I lose all the previous tests. No standard way to regularly run the test. In order to improve the testing, I am going to use the unittest module of the Python standard library. unittest provides the TestCase class which you subclass to add your own test methods. Further there is a TestSuite class which allows you to organize and run your test cases. For the moment I am not going to use TestSuite instances but will let unittest.main take care of providing a simple command line interface for my tests. The -b switch suppresses stdout for successful tests. There is also -v switch which will cause the test runner to name each test. My test from the first post is implemented like this, and the one for the for loop is very similar. All tests I have so far just test that the returned value of the test function is the same in Python and in my own interpreter. When I copied the test for calling a function into the test module I got surprisingly an error. Surprisingly because the same code has worked when it was directly in the interp.py. What happend, and why is it different from when the test was in the interp.py file? The difference is that now the test and square functions are not defined in the global scope. Therefore the test function, when looking for square, will not search for it in the global namespace but in its closure. I will not go into this topic more right now, what counts is that for this test to succeed I will first need to extend my interpreter more. So for the moment I am going to re-write this test case. At the same time I do not want to lose this testcase, but I do not want to have my testing fail for this. unittest provides a decorator, @skip, which will disable the test method with a message. There are also more sophisticated, conditional skips available. For implementing the amended test case I define the executed functions on module level. Actually I am not really satisfied with this solution as the test case is now split onto different parts of the interp_test.py file. If anyone could propose a better way to define this test I would appreciate much your comment! A test function for the following unittest. You can have a look at interp_test.py developed in this post on github. This article by Leonhard Vogt is licensed under a Creative Commons Attribution-ShareAlike 3.0 Unported License.